There is one issue, however, that Mrs. Clinton speaks to where political language is non-existent. That is abortion. Mrs. Clinton is perfectly clear about her position; she not only is in favor of abortion, she believes it is perfectly all right for a woman to have an abortion up to and including the moments right before full term birth. It seems to me that St. JP II’s opinion and Mrs. Clinton’s opinion on the matter are on opposite ends of the Sanctity of Life spectrum. Secularism’s mantra of self-gratification has been the catalyst that has driven people the world over to reject the sanctity of life, fomenting many folks to embrace the false notion that each of us can decide who lives or dies. Why are there so many people determined to bring St. John Paul II’s words to fruition? I think the answer is simple enough; “I” and “me” have replaced “you” and “them”. However, I do believe there is still hope. There are many people who proclaim their catholicity and intend to vote for the Party of Non-Life (those who approve of abortion and euthanasia---Euthanasia is legal in five states, parts of New Mexico and is up for referendum in Colorado ). How folks can be part of a religion and reject what it basically stands for is beyond my understanding. I leave their spirituality up to them. 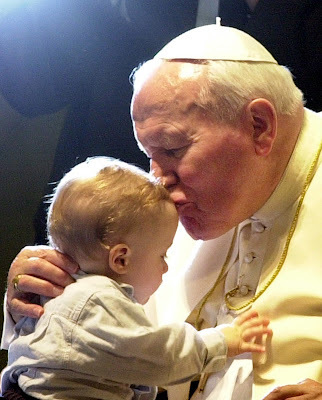 Bottom line---that still leaves a goodly percentage of Catholic/Chrsitians that still embrace the sanctity of God’s individual creations, whatever their age may be including the pre-born. Psalm 139:13-16 speaks to each one of us as God’s individual creations. "For You formed my inward parts; You covered me in my mother's womb. I will praise You, for I am fearfully and wonderfully made; marvelous are Your works, and that my soul knows very well. My frame was not hidden from You, when I was made in secret, and skillfully wrought in the lowest parts of the earth. Your eyes saw my substance, being yet unformed. And in Your book they all were written, the days fashioned for me, when as yet there were none of them." The unexpected candidate for the presidency, Mr. Donald Trump, has proven to be an enigma to the election process. Honestly, I never knew anything about this man except that he was a very wealthy and successful international builder and entrepreneur. He also hosted a #1 rated TV show called the “Apprentice” which was on for 12 years (I actually never watched it). I had never heard anything “bad” about him and I never had an opinion of him one way or another. Then he ran for President of the United States. According to all the political elite and main stream media and many in his own party he is almost akin to a new “Hitler”. He is “evil” personified. Yet, through that all, he stands before the world and says he will defend life and is pro-life and promises to appoint Supreme Court Justices that will be pro-life. That seems to me to be quite "UnHitlerish". As a Catholic man who believes in the Sanctity of Life and honors the fact that his Church defends life I must cast a vote for the person that will also defend that life and also has the power to do something about it. I do not care if that person is obnoxious. I do not care about what they did 10 or 20 or 30 years ago. The color of their hair matters not and if they happen to be the lousiest politician who ever lived, so be it. I, and millions like me, are sickened by the callous disregard for human life especially when this callousness is being disguised as compassionate. It is NOT compassionate. It is bloody, it is destructive and it is fatal. The pages of Catholic/Christian history are filled with countless names of those who came from virtual anonymity and proceeded to leave an indelible mark in our lives. St. Teresa of Calcutta is a prime example. Many have also reached the eternal heights of spiritual greatness but are not so well known. Meet Franz Jagerstatter. Franz was born in Austria in 1907. His father was killed in World War I and when Franz was around eight years old, his mom married Heinrich Jagerstatter who adopted young Franz, giving him his name. Franz received a basic education in the local schools and excelled in reading and writing. He learned religion from his maternal grandmother and would read the Bible and other religious works. He managed to develop a faith which nestled itself securely into his soul. As Franz grew older and wiser his faith grew right along with him. In 1933, Franz, inherited his adopted father’s farm. He then met Franziska Schwaninger, a deeply religious Catholic woman, and they fell in love. They were married Holy Thursday, 1936, and after the ceremony proceeded on a pilgrimage to Rome. This is also when Franz’s spiritual life became his primary focus in all things. Now possessing a deeply imbedded faith and love of Jesus, he soon was serving as a sexton at his local parish. He and Franziska would have three daughters and he began to live his life true to his faith and to Jesus Christ. He would no longer deviate from things that were “not right”. Some perceived him as “overly pious”. He stopped going to taverns because, as a defender of truth, he was always getting into arguments about Nazism and wanted to avoid that. He stopped accepting donations he received as the church sexton and gave the money to the needy even though he and his growing family were poor too. Even though some folks mocked him, he was determined to do “what was right”. In 1938, German soldiers began moving into Austria. Immediately, they began implementing the Nazification of the once peaceful nation. The "Anschluss", which was the creation of a German-Austrian State, was put to a vote in Franz’s village and he was the only one in his town to vote “no”. The authorities rejected his vote and claimed the vote was unanimous. However, Franz was now under watch by the Nazis. It did not matter to Franz. He knew he must do the right thing and remained openly anti-Nazi. He joined the Third Order of St. Francis and began serving as a sacristan at the local parish. He managed to get several exemptions from military service. Time was not to be Franz’s friend. In 1940, when he was 33, Franz was conscripted into the German army. He finished basic training but managed to stay out of the active service because he qualified for an exemption given to farmers. Back home he began to evaluate the morality of war and even discussed the subject with his bishop. His bishop did not encourage Franz. And so it was that on February 23, 1943, Franz Jagerstatter was called to active duty. He and Franziska now had three daughters, the oldest only six. Franz stood strong and refused to fight for the godless, Third Reich. He declared himself a “conscientious objector” and offered to serve as a paramedic. He was ignored. A priest from his town came to talk him into serving but he refused. He was immediately put in prison. Against all advice to stop resisting, Franz persisted in his opposition to the Nazis. He was told by his spiritual advisors that he had an obligation to his family to protect his life. He was told that he was required morally to obey the “legitimate” authorities. A friend told him, “Just say yes. You don’t even have to shoot straight. But take the oath.” Franz rejected all arguments. Atheistic Nazism could not be supported. He was determined to do the “right thing”. Franz Jagerstatter held fast to his principles. On July 6, 1943, he was tried and sentenced to death. On August 9, 1943, he was executed by guillotine at Brandenburg-Gorden prison. He was 36 years old. Franz Jagerstatter led an obscure life and his death was no different. But a priest by the name of Father Jochmann spoke to Franz right before his execution. He said later that Franz was the only saint he had ever met. In 1964 the American sociologist, Gordon Zahn, wrote a book about Franz Jagerstatter titled, In Solitary Witness. That was followed by the renowned Trappist,Thomas Merton, writing a chapter about Franz in one his books, Faith & Violence. Eventually, Franz story weaved its way to the Vatican and came before Pope Benedict XVI. In June of 2007, the Holy Father issued an apostolic exhortation declaring Franz a martyr. On October 27, 2007, Franz Jagerstatter was beatified by Cardinal Jose Martins in Linz, Austria. Franz believed that Jesus wanted him to do the “right thing”. He even gave his life to do it. He is known as the patron of “conscientious objectors”. 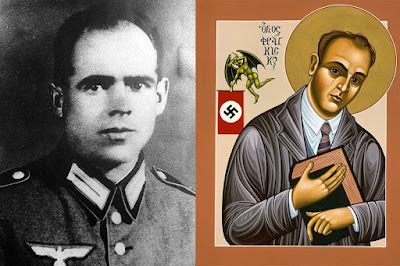 Blessed Franz Jagerstatter, please pray for us. Can a Catholic woman get married and divorce twice, give birth to eight children with two different men, become a nun and eventually found a new religious order? The answer is Yes! In fact, this same woman would, on Mother’s Day in 1990, walk the stairs alone to present the gifts to Pope John Paul II for the Mass he was offering during his visit to Mexico and, in return, receive his blessing. After all, with God, all things are possible. This is about Mother Antonia Brenner who came to be known as the “Prison Angel” of La Mesa Prison. Mother Antonia died three years ago on October 17, 2013. As we think of her life I just thought I should write a few words about this amazing woman. I believe history will show that this woman was one of the greatest among Catholic women of the late 20th and early 21st century. Mary Clarke was born in Beverly Hills on December 1, 1926. Her dad, Joe Clarke, was a successful businessman and Mary and her two siblings grew up surrounded with affluence and the glitz of the movie world. Their neighbors included luminaries such as William Powell, Hedy Lamarr and John Barrymore. Joe Clarke had a deep love for all people. No matter how good life was for his family he made sure his kids were always taught to help the less fortunate. That desire to help others, nurtured by her father, would blossom in Mary and was destined to explode. However, before the "explosion" Mary embarked on a circuitous life journey. Mary married at 18 and had three children, the first dying shortly after birth. That marriage ended in divorce. As a divorcee, Mary now felt distanced from her Catholic upbringing. She married again, this time in a civil service in Las Vegas. It was to a man named Carl Brenner. She and Carl had five children together but ultimately, that marriage also ended in divorce. No matter, God “writes straight with crooked lines” and apparently the Holy Spirit had his eye on Mary Clarke Brenner her entire life. He was about to shower His grace all over His daughter. Mary became more and more involved in charity work. In 1965 she met a priest by the name of Father Henry Vetter. He took her along on a delivery of food, medicine and clothing to the prisoners at La Mesa Penitentiary in Tijuana. 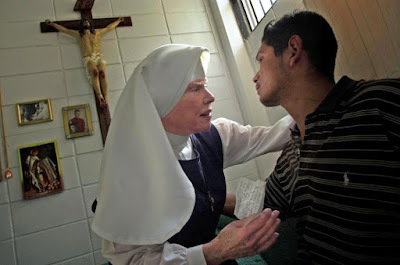 The plight of the prisoners at La Mesa (considered among the worst in Mexico) impacted her greatly and as time went by her growing compassion and love of neighbor would become focused on these people. They would become her specialty, her ministry, her purpose in life. Mary Brenner spent the next ten years traveling back and forth to La Mesa Prison bringing needed supplies but mostly her love and mercy. Her presence became well known and the prisoners, both men and women, began looking forward to her visits. They began calling her “La Mama”. The warden even gave her accommodations so she could sleep over. Mary took the name of Antonia (after her mentor, Monsignor Anthony Bowers) and became Mother Antonia Brenner. She sewed together a nun’s habit, put it on, and went to see Bishop Leo Maher of San Diego. She got down on her knees and told him her story. He had heard all about her and gave her his blessing, validating her ministry. She would even start a new order, Eudist Servants of the Eleventh Hour an order for women 45 and older who wanted to serve the less fortunate. In addition to the blessing from Bishop Maher she also received the blessing of Bishop Juan Jesus Posadas of Tijuana. She had church authorization for her ministry from bishops in two separate countries. After her kids were grown, Mary gave away her belongings, moved out of her home in Ventura and headed to La Mesa Prison. She had received permission to live there. Her new home was to be a 10' by 10' cell in the women’s section of the prison. She would live as any other inmate, sleeping in her concrete cell and having only cold water and prison food. The amenities in her room included a Crucifix on the wall, a Bible, Spanish dictionary and a hard, prison bed. In the morning, she lined up with the other prisoners for roll call. This was to be her home for the next thirty-two years. "La Mama" also became known as "The Prison Angel", She moved freely among the drug traffickers, thieves, murderers, rapists and others, touching cheeks and offering prayers. Many of these people were among the most violent and desperate of both men and women. Yet she happily walked with them and comforted and consoled them, dried their tears and held their heads between her hands as they were dying. She even single handedly stopped prison riots. Mother Antonia Brenner truly saw the face of Christ in each and every prisoner she came in contact with and extended mercy and love to them all. Why else would hardened criminals, some who had never loved or been loved, call the diminutive woman who hailed from Beverly Hills, "La Mama"? They loved her in return. I believe that one day Mother Antonia Brenner will be canonized a saint. She was an example for each and every one of us showing us how to selflessly "love our neighbor" no matter who that might be. Her life also shows all of us that no matter who or what we are or where we have been or what we have done, God is always calling us. 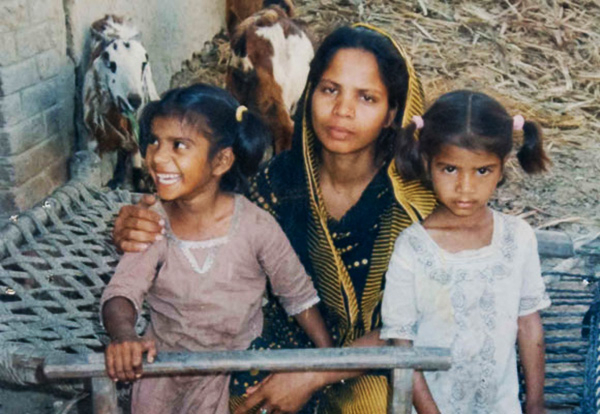 Asia Bibi is a Catholic wife, mother of five and our sister in faith. She will stand before the Supreme Court of Pakistan during the month of October, 2016, and hear the final verdict as to whether or not she should be executed by hanging. You see, Asia has been convicted of being a "blasphemer". She has been in prison for the past seven years. Imagine being this woman. You have been living amidst the filth and squalor of a Pakistani prison. You wonder about your children You miss them so much. You need to hug them, touch them, feel their hair or just squeeze their hands(s). Then a distant memory floats to the forefront of your worn out mind. You remember that day in 2009...was it June..no, maybe August. You remember being out in the field picking berries. There are other women working alongside you but...there is a difference. They are Muslim and, to them, you are "unclean". They despise you. You are a Catholic. These other women demanded you fetch them water from a nearby well. You were not their "equals" and did what you were told. You went to the well, filled a jug for the women and brought it back to them. But you made a mistake. You knew you could not drink from the same jug so you found an old tin can and poured water into it for yourself. You remember the momentary relief as the water slid down your throat..
Alas, using the dirty, rusted cup to drink from mattered not. A field hand angrily tells you that you are forbidden to drink the SAME water as a Muslim. You are already considered "unclean" because you are a Catholic/Christian. The other workers hurriedly gathered around you and started cursing you and your religion. Your faith must have been exploding in you because you defended it immediately. You summoned your resolve and remember saying, "I believe in my religion and in Jesus Christ who died for the sins of mankind. What did your prophet Mohammed ever do to save mankind?" The other women exploded with rage. You were beaten and arrested. Under the country's Sharia Law you are not equal to a Muslim so what you had to say was only considered "half" as important as what they had to say. Trying to defend yourself was an effort in futility. They hold you in a local jail for one year and then you are found guilty of blasphemy. Your sentence is death by hanging. You are shocked and horrified and helpless. Your husband is sickened and your children lost inside themselves. You can do nothing. You are sent to prison and placed on death row. Five years later the Pakistani Supreme Court upheld the verdict. That was appealed and the hanging was put on hold. It has been announced that sometime during the middle of October, 2016, the High Court of Pakistan will render a FINAL verdict. Asia Bibi, Catholic "blasphemer ", lover and defender of Jesus Christ, will hear whether or not she lives or dies. I cannot help but feel a deep affinity for Asia Bibi and all those who live under such incredibly hateful conditions.. After all, we are all part of the same spiritual family. They are people just like you and I. They love their spouses and children and their moms and dads. They get the flu and upset stomachs. They get rashes and toothaches and they have wants and desires. They want a nice home that is safe and secure. They would like to have a church they can go to without a fear of being killed or maimed for doing so. They just want to worship the God they love and have some peace in their lives. Yet, they are hated and despised. Why--because they are just like us. They are Catholic/Christian and believe in Jesus Christ. This morning, I was able to drive over to my church and attend morning Mass. No fuss, no muss, no anxiety existed. No one mocked me. No one cursed me. On the contrary, going to Mass in America is a beautiful experience that is filled with peace and love. After all, we are free Americans allowed to practice our religion unencumbered (so far). Asia Bibi is just one of thousands of our brothers and sisters in faith whose lives are in jeopardy at this very moment. Just like us, they love Jesus Christ. There is a glaring difference. We Americans can pour another cup of coffee and say another prayer. Our brothers and sisters in faith, living in the lands of the persecuted, can be brutally killed for doing the exact same thing. We must fight to stay who we are, inside and out. Please pray for our sister, Asia Bibi. She faces a horrible death because she loves Jesus. A different place or a different time, that could be any one of us. Maria Anna Barbara Koob was born on January 23, 1838 in Germany. The year after her birth her mom and dad emigrated to America settling in Utica, N.Y. Devout Catholics, they joined St. Joseph's Parish near their new home. They also changed their name to Cope to become more "American". The years moved by and Maria's mom gave birth to nine more children. Life was never dull in the Cope household. Maria felt a call to the religious life when she was very young. However, as the oldest of ten children, loyalty to family would take precedence over any personal ambitions she might have had. When her dad took ill and became an invalid, the eighth grader was forced to go to work in a textile factory to help support the family. Maria continued working in the textile mill for almost ten years. Maria's dad passed on in 1862 but by then some of her younger siblings were helping with the family's daily life, including finances. Maria, at 25 years-old, was finally able to pursue her dream. She entered the novitiate of the Sisters of St. Francis in Syracuse, N.Y. On November 19, 1862 she received the habit and became Sister Marianne. Sister Marianne had wanted to be a teacher but for some reason began doing administrative work. She quickly found herself appointed to the governing boards of her religious community and helped establish the first two hospitals in central New York State. This was followed by becoming the nurse-administrator at St. Joseph's Hospital in Syracuse N.Y. Sister Marianne had outstanding organizational and leadership skills but she also possessed a deep and almost natural affinity for those considered marginalized and treated as "outcasts". She was even criticized for her special devotion to those who needed help the most. It was also obvious to others that the Holy Spirit moved within her. By 1883 she was the Provincial Mother in Syracuse and known as Mother Marianne Cope. One day she received an unexpected letter from a Catholic priest in Hawaii. He was asking for help in managing schools and hospitals in the Hawaiian Islands. The letter was also clear that the main focus of the work would be with leprosy patients. Mother Marianne's life purpose had just been laid before her. Today leprosy (real name, Hansen's Disease) is readily curable. In 1980 there were over 5 million cases worldwide. In 2012 that number was down to 189,000. In the past 20 years, 16 million people have been cured of this disease and only 200 cases are reported in the United States each year. But in 1883, when Mother Marianne and her followers arrived in Hawaii, that was not the case. Leprosy was widespread and dreaded as extremely contagious. People with Hansen's Disease were avoided and prohibited from many public places. When Mother Marianne and her six companion nuns arrived in Honolulu, they were directed to the Kaka'ako Branch Hospital in Oahu. This served as a receiving station for leprosy patients from all over the islands. Within a year they had founded the Kapi'olani Home for the purpose of caring for the homeless children of Hansen Disease patients. The most severe cases were sent to the island of Moloka'i and placed in the settlement known as Kalaupapa. This is where Father Damien was working. Sister Marianne met the renowned priest in 1884. He was still in good health. Father Damien (now St. Damien of Moloka'i) was diagnosed with Hansen's Disease in 1886. When Mother Marianne heard that Father Damien's presence was unwelcome in so many places she began to tend to him herself. Things fell into place when a new government came into power in 1887. They asked Mother to PLEASE open a home for women and girls at Kalaupapa on Molokai. She joyfully embraced the request knowing that her prayers had once again been answered. In addition, she could now be closer to the withering, Father Damien, who she cared for until his death in April of 1889. Mother Marianne passed away on August 9, 1918. She was canonized a saint on October 21, 2012 by Pope Benedict XVI. 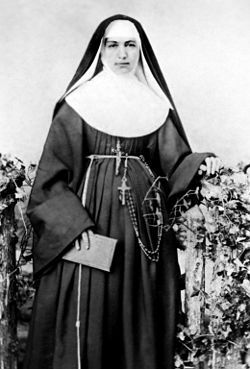 St. Marianne Cope, please pray for us all.